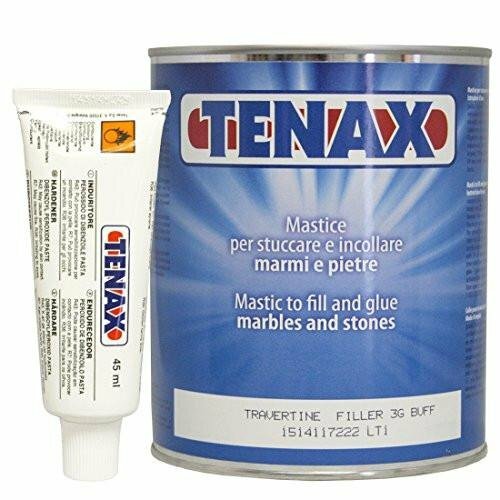 Tenax Travertine Filler is an excellent product for filling travertine. Unlike grouting the travertine, this is buff colored to match it and will stay in place permanently! This polyester based glue is semi-solid and comes with the hardener as shown. This is exactly what slab manufacturers use to fill travertine before selling it on the market. Use what the professionals use! This is a HazMat (hazardous material). It can only be shipped via UPS Ground Delivery to the continental USA or UPS Standard Delivery to Canada. It is not able to be shipped via any other level of service or outside of the continental USA and Canada. Ships to CONTINENTAL U.S.A. and Canada only-- it is not available for delivery to Alaska or Hawaii. Hazmat-- only ships to the continental 48 states via UPS.